On an estate in Giverny, France sits a long two-story home, its pink facade perforated with windows, each framed by Veronese green shutters. Intermittently, a Virginia creeper meanders its way up, around and between the windows. In front of the home an orchard space has been converted into an expansive flower garden. Beyond, a river has been expertly manipulated into a serene water garden. This was the home of Claude Monet. At the Milwaukee Art Museum Impressionism: Masterworks on Paper has made its debut with more than 120 drawings, watercolors, and pastels on display from some of the best known (and even a few lesser known) impressionist and post-impressionist artists. This seems a fitting time, in the spirit of impressionism, to discuss (in lieu of any one piece from his oeuvre) Monet’s home and gardens in Giverny, France. Monet spent the last half of his life, a total of 43 years in Giverny. 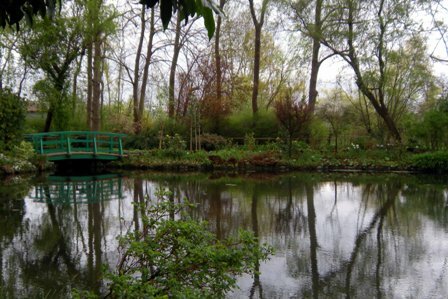 Located about 50 miles northwest of Paris, Giverny was a small town of 279 people (little changed from the Middle Ages) when Monet made his home there in 1883. Though Monet would become a wealthy man by the 1890s, prior decades found him struggling with poverty. He relied almost entirely on the sale of his paintings for income and Impressionism’s unfavorable critical and public reception strained him financially. To ameliorate some of their expenses, the Monet family shared a home with the Hoschedé family, Alice, Ernest, and their six children (also suffering financially). They lived first in the riverside village of Vétheuil. It was here that Monet’s wife Camille passed away leaving behind their two sons. Alice’s husband Ernest became increasingly estranged. In 1881 Monet, Alice, and the children moved together to Poissy. However, Monet found the suburban nature of Poissy disagreeable, much preferring the countryside of Vétheuil. Thus, in early 1883 Monet began looking for a new residence. He took a train ride through the country and came across Giverny. He was enchanted by the calm River Epte, its streams and marshy meadows, the surrounding poplars, and quality of light. Water Garden view. Photo by the author. The property he chose to rent consisted of two homes and several outbuildings looking out onto an orchard and the river beyond. The main house consists of four rooms on the first level, four on the second, two attic rooms, and a cellar. The smaller house contained several rooms, including a kitchen and stable. 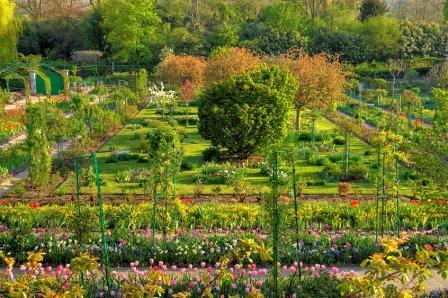 Almost immediately after his relocation to Giverny, Monet began planning the garden and planting an array of flowers. By the end of the 1880s tides had turned and impressionism was now acclaimed by critics and popular in the fashionable circles of Paris. 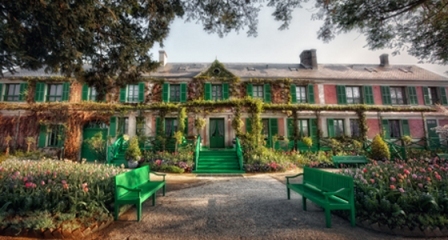 Monet became wealthy enough to purchase the home for a total of 22,000 francs in 1890. He made improvements to his home, extending and modernizing the kitchen and painting the grey shutters a bright Veronese green (a color echoed by the Japanese bridges in the water garden). For the interior he favored a simple decorative scheme, as opposed to the conventional (and more opulent) taste of borrowing from the past. 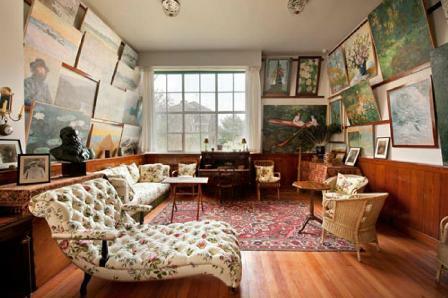 Walls were painted in solid colors so as to provide a backdrop for his large collection of prints and paintings. However, it is the gardens that are the real marvel and what many of us recognize today from Monet’s famous water lily paintings. 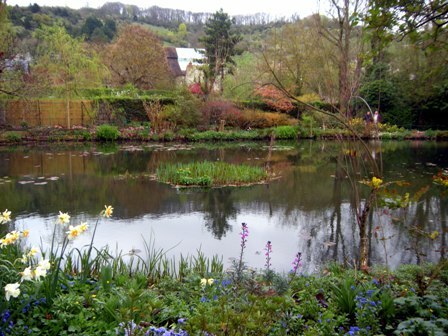 Upon settling in Giverny Monet began planting flowers in the orchard in the front of the home. Initially, Monet did all the planting himself but as his fortunes grew (and the scope of his gardens) he was able to employ six gardeners. Bridge at Monet home. Photo by the author. Wishing to extend beyond the orchard, Monet purchased a piece of land in 1893 along the River Ru and in 1901 obtained permission to divert the stream and enlarge an existing pond. It is here that he constructed his water gardens, planting willow trees, poplars, rare lilies, azaleas, rhododendrons, roses, and more. 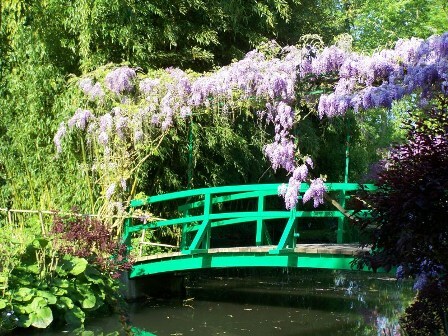 Across the pond he built a small green Japanese bridge over which he grew white and mauve wisterias. In 1901 the critic Arsène Alexandre wrote, “…the garden is Monet,” a statement that expresses a state of union between Monet and Giverny. 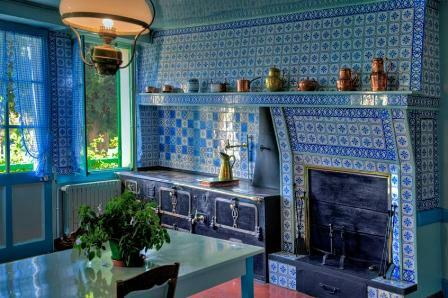 Giverny was Monet’s muse, providing 43 years of inspiration. What inspired other impressionist and post-impressionist artists? Talk a walk through Impressionism: Masterworks on Paper. Would you describe the ballet as Degas’s muse? How about Van Gogh, in what ways did the hospital he had himself committed to inspire his work? Michels, Heide. 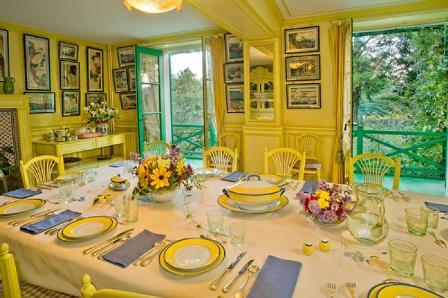 Monet’s House: An Impressionist Interior. London: Frances Lincoln, 2006. Katrina Porod works at the Museum’s ticketing desk to assist and guide Museum visitors. To enrich the visitor experience, she draws upon her art history education and past experience as a Museum curatorial intern. This entry was posted in Art, Curatorial, Exhibitions and tagged Claude Monet, French Art, Impressionism, Impressionism: Masterworks on Paper. Bookmark the permalink.